Liverpool have confirmed a deal to sign RB Leipzig's Naby Keita, with the midfielder moving to Anfield in July 2018. The Reds have agreed to pay the £48m release clause that will allow the 22-year-old to move next summer, plus an undisclosed premium. "My commitment to RBL remains absolute for the remainder of my time at the club. Having my future resolved means I can now focus on helping RBL achieve great things this season. RB Leipzig finished second behind Bayern Munich in the Bundesliga last season, meaning they qualified for the Champions League group stage. 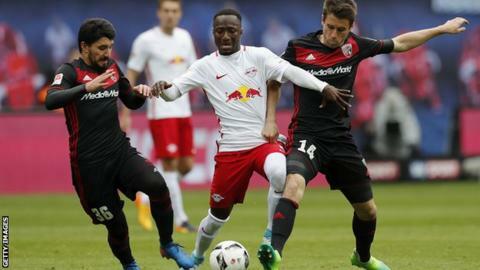 Liverpool had already had two offers for the Guinea international rejected this summer - the second understood to be about £70m - but now a compromise deal has been reached where Leipzig keep their prize asset this season and Klopp gets the player next summer. The Anfield club are also prepared to test Monaco's resolve to keep midfielder Thomas Lemar with an offer of about £60m before Thursday's transfer deadline. Earlier this month, Naby Keita was described by Schalke sporting director Christian Heidel as being like "two players". He is right. While Liverpool won't be able to get away with playing with 12 men, as Heidel joked at the time, he does effectively play two positions at the same time. He is both a number eight and a number 10 in that he wins plenty of tackles and has that wonderful ability to emerge with the ball when it looks almost impossible to do, and at the same time his dribbling skills are reminiscent of Sadio Mane. He will pick apart a defence with a clever through ball too. It's pointless to talk about whether he is worth the club record fee. It is 2017 and these days buying a footballer is no different to buying a house - they are worth what someone is willing to pay. The concept of purchasing someone you won't be able to play for a year is alien to the Premier League, but it is commonplace in Germany. I suspect Jurgen Klopp will have had no qualms with it and the former Borussia Dortmund manager will have been one of the key factors in Liverpool getting their man.